La Boca, a neighborhood in Buenos Aires is primarily known for four things: colorful houses, the Boca Juniors futbol club, danger, and poverty. At least, these were the impressions I held as I boarded the good old #64 bus Plaza de Mayo/La Boca route. Things started off a little ominously when the driver of the first #64 told us he didn’t go to La Boca, even though his windshield placard said the contrary. Unable to ask any important questions and lacking the desire to hold up the bus the four Australians and I stepped off the bus back onto the curb, proverbial tails between our real legs. Within minutes another bus careened down the street and pulled to an abrupt stop alongside the curb. This time we were given the OK by the driver and I proceeded to fumble with my change to pay for the ticket. This was the last of my troubles. Twenty minutes on the refreshingly uncrowded bus got us to the end of the line: Caminito, a street in La Boca that is the heart of the tourist section. You may be tempted, like I was, to hop off the bus before the end of the line because you think you have gone too far, but you’d be wrong. 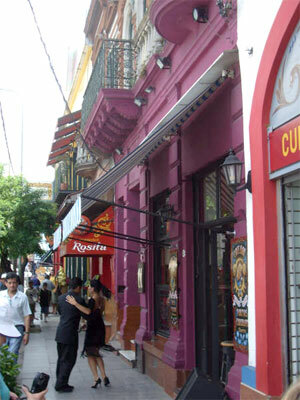 La Boca is a large neighborhood, but the area devoted to tourism is very inconspicuous. Immediately after disembarking we saw a large boat resting in a small port to one side and a small open air market with crafts, a row of houses that were purple and green, and two Argentineans tangoing to music on the sidewalk in front of a restaurant on the other. Although it is common, Argentineans don’t spontaneously tango on sidewalks just for fun. For the more nervous of us out there a rough guide to safety in La Boca may read: As long as a majority of the houses along the block you are walking along are a bright pastel you can release your death grip on any valuables. That said, if you follow this slightly hypersensitive advice you will be confined to about 5 square blocks. These blocks are indeed excellent, but you will still be missing out on an experience. The restaurants and gifts shops are great, but a little tacky. The artists and local crafts that are for sale and on display in the streets are better. The constant presence of Maradonna–Argentinean soccer legend who is arguably the best futballer ever and ardent supporter of the Boca Juniors team–is…well constant. His face and memorabila are everywhere. All is quaint, cute, photogenic, and comfortable. However, another reality lies just a few blocks away. La Boca has reputations of poverty and danger because it is incredibly poor and is home to some renowned hooliganism that has been rampant at the Boca Juniors futbol games, especially against their rivals River Plate. Here, fanatics have been know to throw stones, rob, and beat up people. However, the violence is generally directed towards fanatics from opposing teams. How different is that from England or Spain though? There is also the problem of robbery. This exists everywhere tourism has taken over a community though. If I had been carrying anything I wouldn’t have been as concerned as I was in parts of Costa Rica or Hawaii. However, the slightest bit of pre-planning can minimize any significant risk of loss. Common sense says to bring only some money for transportation (bus or cab) and gifts. I brought a camera as well and took plenty of photographs, but was sure to put it in my front pocket when I was not using it. Otherwise, I had nothing on my person. We strayed from the colored houses in order to see the Boca Stadium, only a few blocks away. The difference was immediately palpable. There was an increase in greyscale, street graffiti, and a few policemen. There was a sharp decrease in the number of strolling tourists soaking in the sights. I spent a month in Nicaragua and this was the only time Argentina has felt at all similar. 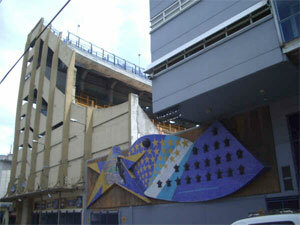 For approximately $6 USD you can take a tour of the soccer musuem and have a tour of the futbol stadium. We opted not to do this, only because we all planned on trying to catch one of the home games. It is easy to be in Buenos Aires and forget that you are in a country that suffered a massive economic collapse in 2002. The central areas of Palermo, Recoleta, and el Centro offer an experience that at times feels like Italy, Spain, or the United States. However, a trip to La Boca is a nice reminder of some of the realities that exist here. Everywhere, actually. It is an interesting little pocket of culture that shouldn’t be missed. To get to La Boca there are a three options: walk, bus, or taxi. Two girls from Israel I met walked and said that it was a pretty intimidating introduction to Buenos Aires. I took a bus and had absolutely no problem. A taxi won´t cost more than a few USD. It all depends on what you want to get out of the experience and how comfortable you are being in an area that is extremely poor. 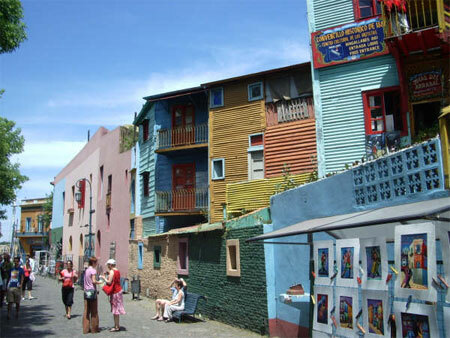 Other La Boca experiences include: volunteer trips that can be arranged by almost any hostel. Hostels also offer full service futbol game experiences with shuttles and pre-arranged seating. The price generally is around 35 USD, whereas buying the tickets yourself costs $5 USD, with an added 1-5 USD for round trip transportation depending if you take a bus or taxi. Wow, Oliver Hartman is a stellar writer, I really felt the experience in La Boca. I hope one day I will meet him and we can share a moxie. The Boca is fantastic. Caminito street and food are beatiful. Dont forget use your TOURIST CARD for benefits. hola!! yo me llamo nicole y soy de argentina, tengo 11 años me rre gusta la boca es rre lindo y yo fui una vez con mi salon..
From what I’ve read, I can see that La Boca is a massive tourist attraction. This is really good for a region which is especially poor. Great writing. I’ve really enjoyed. This page rendered in 0.655 seconds.